This month’s walk starts in picturesque Wargrave and covers a variety of terrain. Park either in the station car park and walk back down the road away from the station, passing the entrance to St Mary’s Church on your left and onto the A321. Cross over and take the footpath marked R.U.P.P. (Roads Used as Public Paths) almost opposite. When this crosses a road, rather than continuing on the R.U.P.P. which leads to a graveyard at the bottom of the lane, take the small footpath that veers off to the right slightly. You’ll pass the triangular Lady of our Peace Catholic Church on your right, and see a long drop down twenty feet or more to a copse on your left. After a short while, the path bends left, crossing farm land. From here you can begin to see the soft fruit vines of Sheeplands Farm. At a small bench, the path meets the B477 and you’ll need to walk along the road for a short distance before picking up the path on the right again to walk along the edge of one of the farm’s fields. Say hello to the strawberry and raspberry pickers as you pass by and see how many different languages your greeting is returned in. The footpath carries on straight ahead and crosses the A4 through a metal gate. Here you enter completely different fields, full of golden wheat that shines in the sun, and makes a gentle popping sound in the wind. Along the path you can still see poppies. Birds and butterflies flit from one ear of wheat to another. 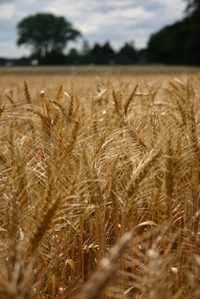 The first path through the wheat runs alongside a row of trees. Cross another perpendicular path and you reach a three-way fork. Take the middle path through the wheat and you’ll come out through a gate onto London Road, as it meets the New Road to Ruscombe. Opposite where you came out, at the turn-off, there’s a path leading to Northbury Farm. Follow the dog-leg onto Castle End road heading South (turning right) and at the T-junction cross over to Church Lane where St James the Great Church sits on the corner. The church is lovely and well worth a visit. Its history is display on the left as you walk through the door. The chapel was built in the 11th Century. The first vicar, Jordan, recorded in 1220, was tested and found to be wanting by the Dean, who suggested he be replaced. Look for the Ten Commandments painted on the wall over the oak beams in the sixteenth century and the stained glass windows. From the church, continue along the road over the railway lines where the tracks are lined with massive apple trees growing alongside. Look out for a footpath on your right after a dog-leg in the road by Southbury Farm. Here pairs of red kites can be seen circling their prey. Follow the path on the right across a field of sheep, past Ruscombe Down on the right and over three stiles in total before you reach the road. Admire the imposing frontage of Stanlake Park on your left. A manor house has stood here since 1166 when it was called Hinton Pipard. The current house dates from 1610. You can go right into the manor grounds, which have housed a vineyard since the 1970s by following the road to your left. There’s a very pleasing wine shop in the Clocktower, which was built in 1688, where you’re encouraged to partake in a tasting before imbibing in a glass (or a bottle) of wine in the garden. Wine is £2.50 per glass, bottles range from £6.49 and soft drinks, snacks and pickles are also available. Its open from 11am (noon on Sundays) to 5pm daily in the summer. After the wine tasting, wobble back across the road to Stanlake Bridge to meet the footpath opposite. Here you will question whether you drank too much as the field is home to a troupe of little white ponies who look like they may have escaped from the circus, plus three very friendly donkeys. You are guaranteed to be followed to the stile at the end, where you cross a small footbridge and then take a left then a right turn through the maize field onto Hogmoor Lane, where you need to turn right. The lane leads back across the A321 and becomes a smaller path leading to Whistley Bridge. Take a right and walk along the single track road here, or follow the bridleways and paths that run parallel on either side. These are full of dragonflies and butterflies fluttering around the buddleia, but watch out for the thistles and brambles as the paths are quite overgrown in places. At the end on the left you get quite a good view of one of the private Whistley Mill fishing lakes. Here at Copper Bridge you could start heading back via the footpath on the right, but on a hot day, continue on slightly further by taking the footbridge on the left and following the path along the horses field to the stile at the other side, cross Giddy Bridge then walk into the garden of the Lands End pub. You could arrive here by following the road, but this route saves you getting your feet wet in the ford. Retrace your steps back to the footpath opposite Copper Bridge for the return journey. Follow this path along, past more private fishing lakes and under the railway bridge. Here you will come out in the Loddon Nature Reserve, right on the banks of one of the lakes, which were formed from flooded gravel pits. It’s a lovely spot to stop and bird watch. You can see gulls, swans, coots, grebes, mallards and if you’re very lucky, a flash of blue as an elusive kingfisher zips past. The path bends right around the lake, picking up the River Loddon, whose banks are filled with Early Purple orchids and swarming with dragonflies and their larger cousins, the Banded Demoiselle. At the end of the path two footbridges take you over the weir, next to the flats built on the site of the Old Silk Mill before you come out on Silk Road. Here turn right onto the A3032 London Road, past the Duke of Wellington pub to the crossroads, where you can turn right and follow the signs to Twyford station, to catch the train for the four minute journey back to Wargrave. Alternatively, if you want to keep on walking, you can turn left and walk the two miles back to Wargrave along the A321 Wargrave Road, crossing the A4 Bath Road at the roundabout.